This fragrant and nourishing soup quickly comes together with ingredients you probably already have on hand. Besides the meat for the meatballs and dill for the soup, the other elements are pretty standard pantry and fridge items. 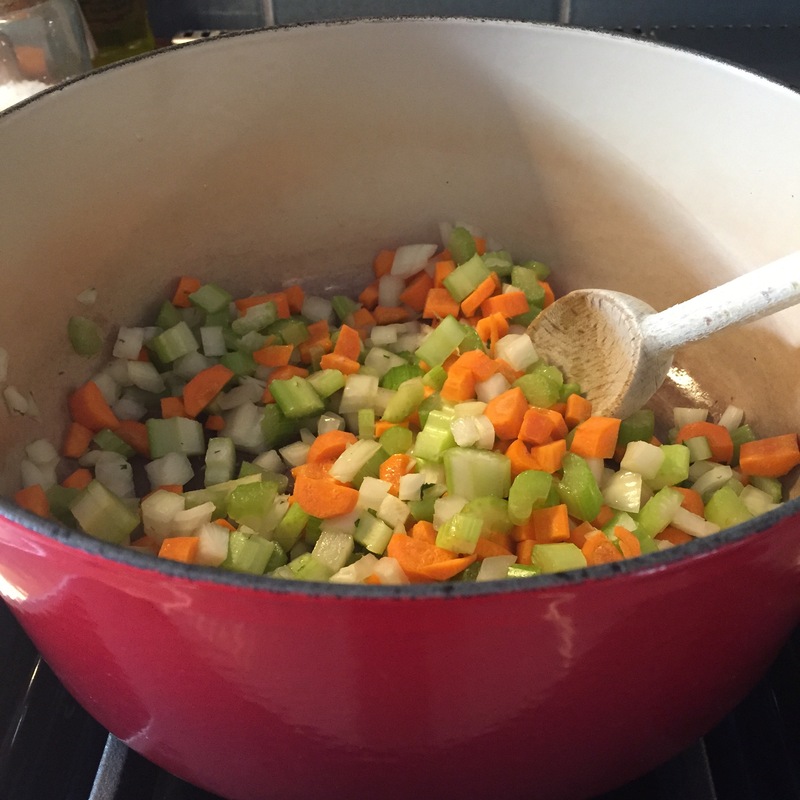 The humble, but delicious broth begins with a “holy trinity” of carrots, celery, and onions; the addition of white wine and dill brings about a brightness and freshness. I especially love the meatballs, “pre-seasoned” by using Italian sausage mixed with ground turkey. And, instead of standing over a stove cooking them in hot oil, inevitably developing tiny blisters over your hands and wrists from splattering grease (clearly, I am speaking from experience), the balls are measured with a small ice-cream scoop, laid in neat little rows, and baked in the oven. I often double the meatball recipe and freeze half for future soups, pasta nights, or meatball subs. These bite sized gems are incredibly handy to have tucked away in the freezer for last minute snacks, appetizers, or meals. 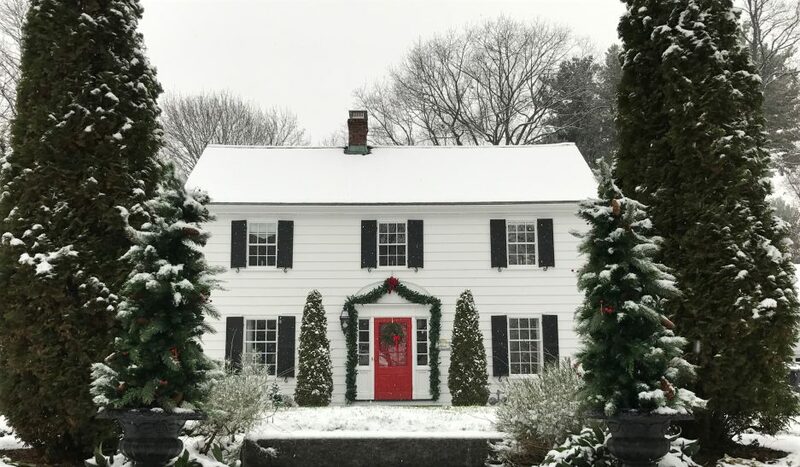 The original recipe appears in Ina Garten’s Back to Basics. I’ve tweaked it a bit for my tastes (and you can, too). For example, while the original calls for ground chicken and chicken sausage, I use ground turkey and regular Italian pork sausage, one sweet and one spicy. Ina uses a tiny pasta, such as tubetini or stars, which I can’t always find. Instead I use orzo, a staple in my pantry. I cook the orzo separately and add it to the broth right before serving, otherwise the pasta soaks up too much liquid. Not that that’s the end of the world; it will happen if you have leftovers. Simply thin the soup with a bit of water or stock. Speaking of stock, you will need 10 cups- homemade or store bought. Though I love homemade stock, I’ll be completely honest, I don’t always have some stashed in the freezer. Good quality store bought stock is smart to have on hand and I do, though I am very picky about the brand. 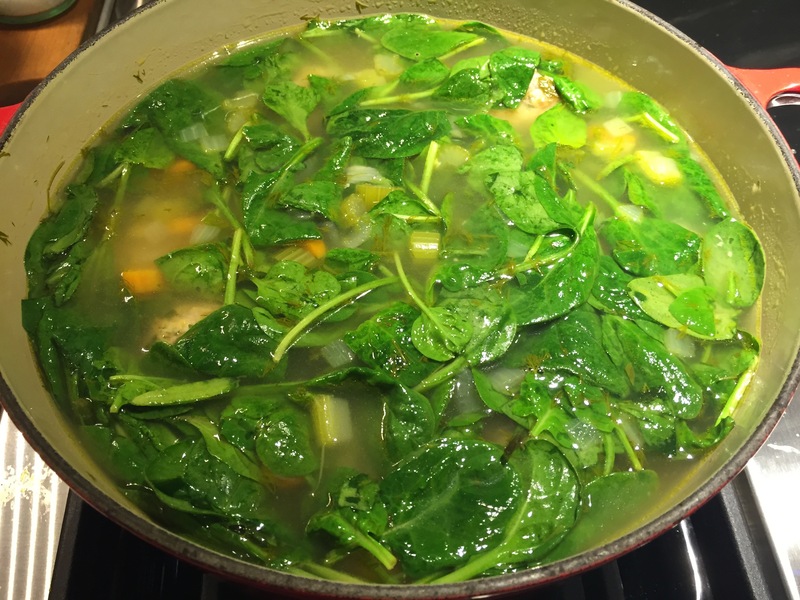 I only use low sodium Swanson’s Organic Chicken Stock (Swanson’s did NOT pay me to write that!). On another note, while no one in my family suffers from celiac disease, one of my best friends does. Whenever I can, I reach for a recipe that with just a little tinkering, can be one everyone at the table enjoys. 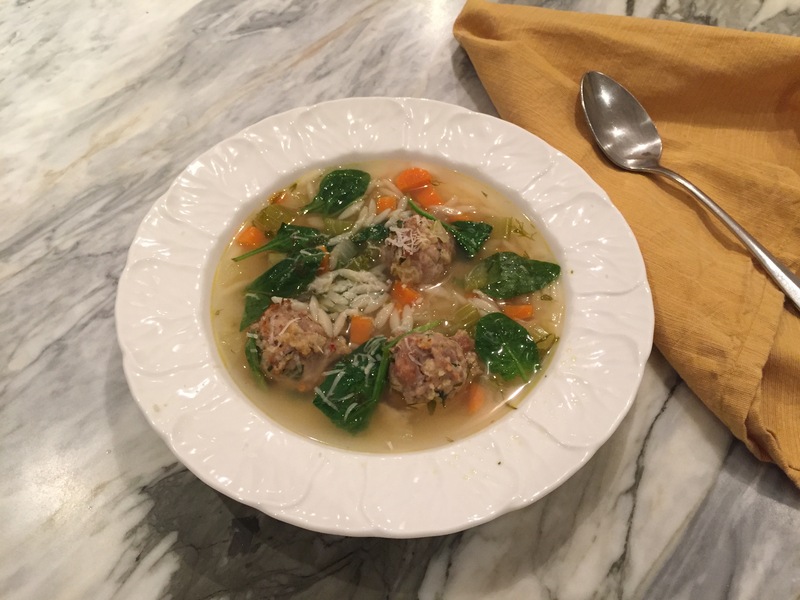 This Italian Wedding Soup is one of those easily adjusted recipes. Simply use gluten free breadcrumbs, and a small gluten free pasta to replace the orzo, or if that isn’t available, rice would be a fine substitute. As always, I encourage you to “play with your food!” If your CSA pick up included lots of kale, chard, or other greens use them instead of spinach. Do you love carrots? Add more. Are there other veggies lingering in your vegetable drawer… turnips, leeks, or even a handful of cherry or grape tomatoes would be savory additions to this lovely soup. Most importantly, have fun and enjoy gathering your friends and family around the table to share a meal. 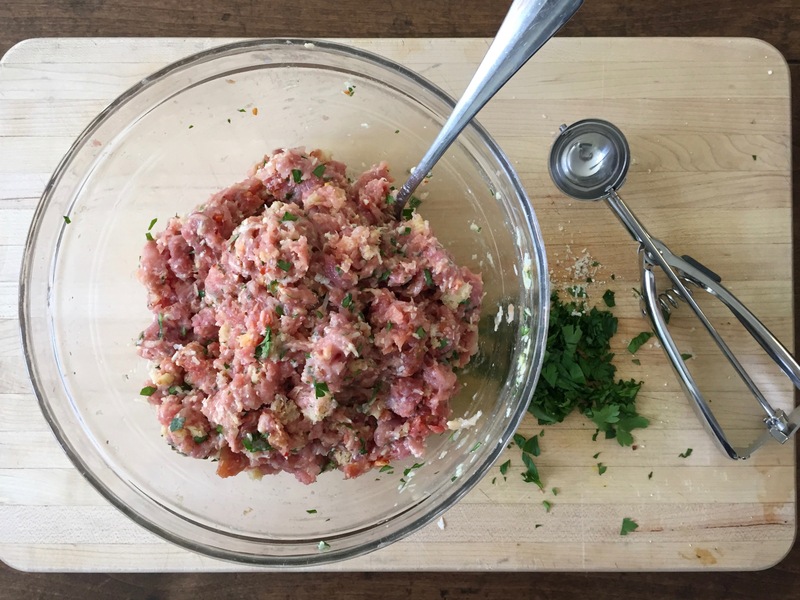 For the meatballs, place the ground turkey, sausage, bread crumbs, garlic, parsley, Pecorino, Parmesan, milk, egg, 1 teaspoon salt, and ½ teaspoon pepper in a bowl and combine gently with a fork. 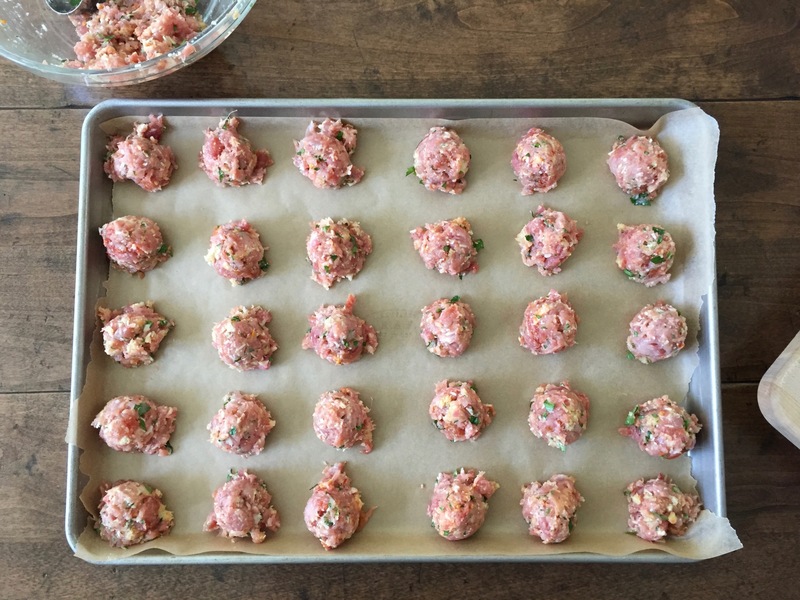 Using a tablespoon or small ice-cream scoop, drop 1 to 1 ¼-inch meatballs onto a parchment lined sheet pan. You will have about 40 meatballs. Bake for 30 minutes, until cooked through and lightly browned. Set aside. In the meantime, for the soup, cook orzo (or rice) according to package directions, removing a minute or two before it’s done. Rinse and drain, toss with a little extra virgin olive oil to prevent sticking and set aside. Heat the olive oil over medium low heat in a large, heavy bottomed soup pot. Add the onion, carrots, and celery and sauté until softened, 5-6 minutes, stirring occasionally. Add the chicken stock and wine and bring to a boil. Add the fresh dill and then the meatballs and cooked orzo to the soup and simmer for 1 minute. Taste for salt and pepper. 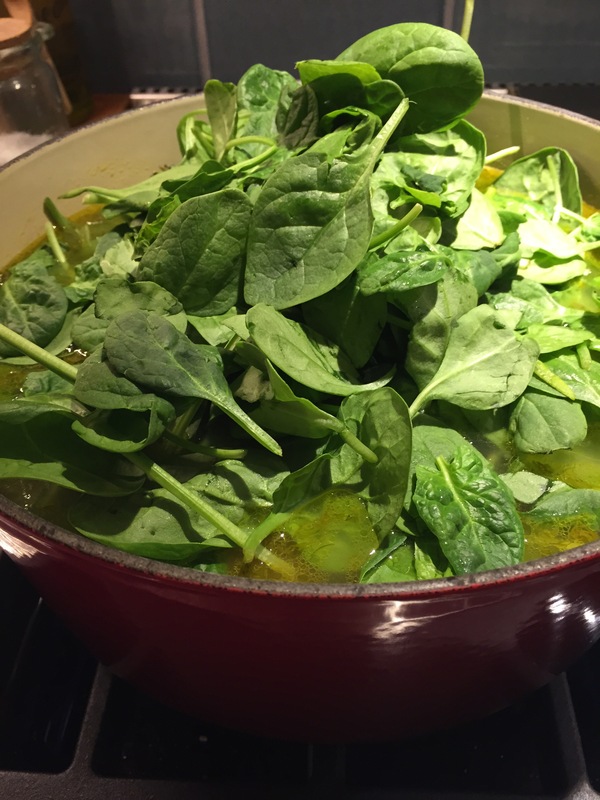 Stir in the fresh spinach and cook for 1 minute, just until the spinach is wilted. Ladle into soup bowls and sprinkle each serving with extra grated Parmesan cheese. 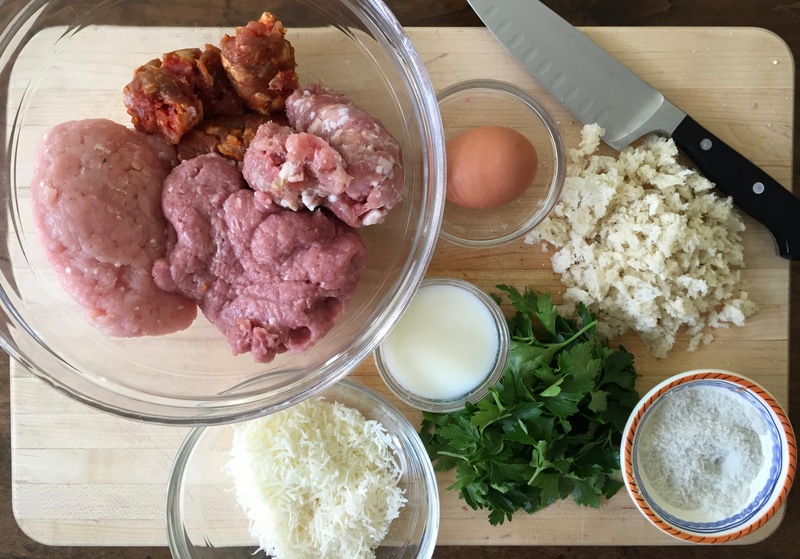 Using a fork, gently combine all of the meatball ingredients. 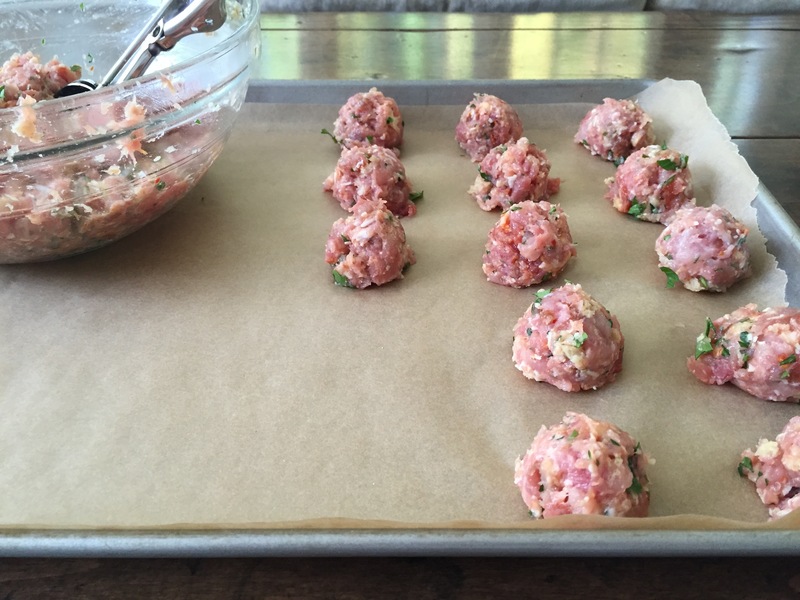 Using a tablespoon or small ice cream scoop, measure out the meatballs. 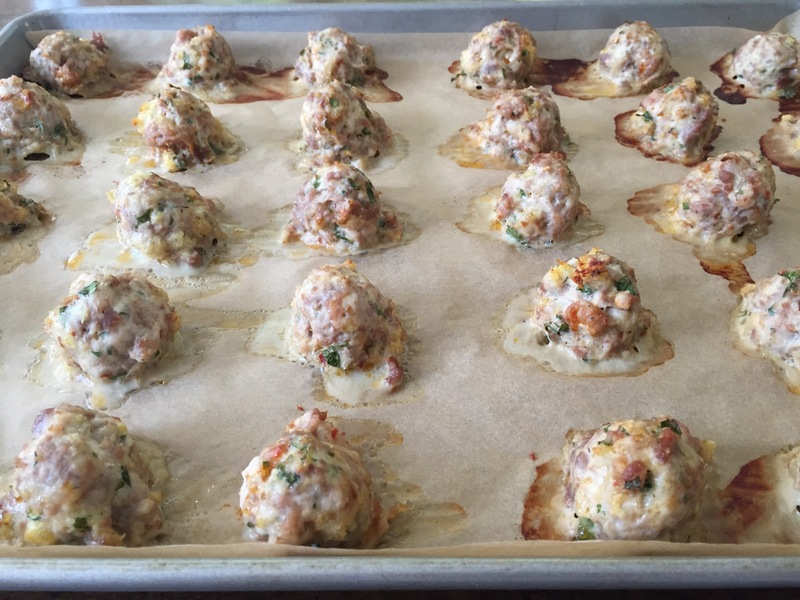 Bake the meatballs in a 350°F oven for 30 minutes, or until lightly browned and cooked through. The meatballs are done and ready for the soup (or freezer). 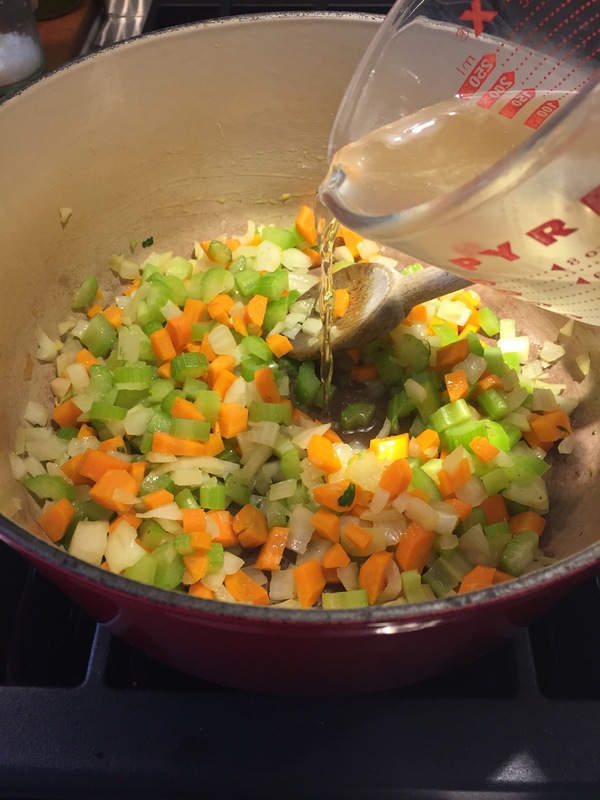 Carrots, celery, and onions are the base of the broth. Add wine and chicken stock. Meatballs, orzo, and dill are added. Spinach is the last ingredient to be added and only takes a minute to wilt. Soup is ready! Serve with a warm crusty loaf of bread and parmesan for passing at the table. 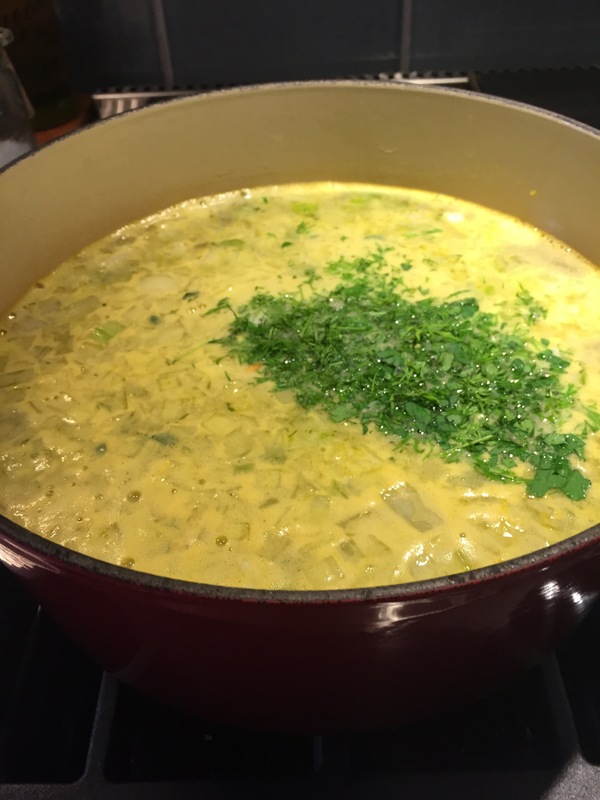 I love this soup (I’m a huge soup – eater because I watch my calories constantly) and it looks delicious. 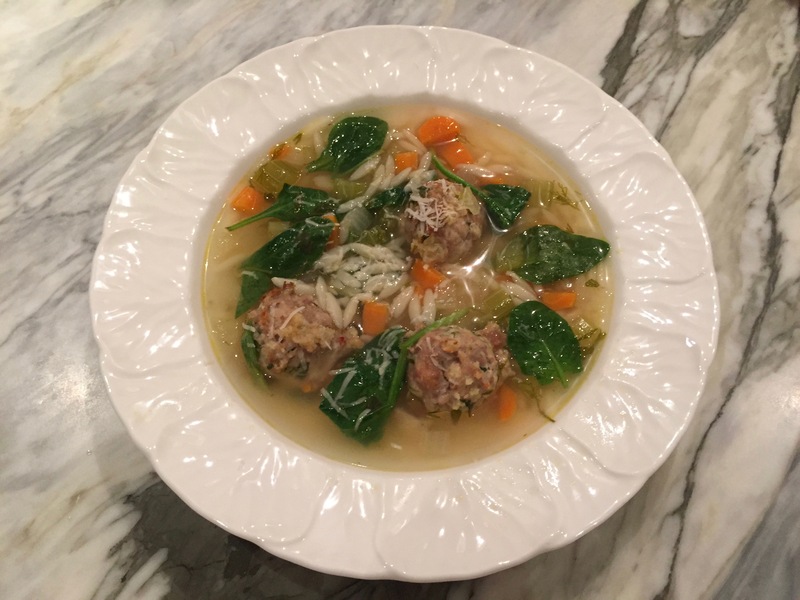 And I like the idea that the meatballs are oven-cooked first and then added to the soup. The orzo variation is very nice too. I love soup too! And this one is good… even my “out of the box mac ‘n cheese” guy requests it. Cooking the meatballs in the oven is extraordinarily helpful; it frees up your time, counter space, and stovetop, as well as eliminating all the extra fat for frying. All good things! Oh yes this soup looks fantastic, I make soup at least once a week when the weather is cold. I will make this very soon, saved the recipe. Love the meatballs in the soup, it’s so delicious. Love the idea. Unthinking would be fun to do that everyone post a soup recipe on the same day!!! Lovely method. The soup looks like a real Autumn warmer. Thank you, Conor! It is a tasty way to warm up as these days get cooler. This looks a fantasic soup, especially with winter weather on the horizon. The meatballs look scrumptious and so easy to make. Thank you for another tasty recipe. Thanks! I heated up the leftovers and filled a thermos for my daughter’s school lunch- a great way to warm up after outside recess. That would make a great lunch for her for this time of year! Salad doen’t quite do the trick, does it? I just love that I want a bowl –honestly, right now! hearty and full of flavor!